What is Uniformity Requirements of Ready Mixed Concrete? Concrete uniformity requirements is very important requirements that control almost all specifications for ready mixed concrete industry as per ASTMC94/C. This is the pre-requirements for providing specifications for almost all parameters of ready mixed concrete. These requirements not only used in ASTMC94/C but also in other specifications related to concrete quality , batching and other standards related to concrete in ASTM standard. In describing table of Uniformity some terms related to concrete uniformity requirements have to be discussed; first comes coarse aggregate content. which is related to understand strength, sampling and testing, mixing and delivery and all other specifications. This term is expressed in percentage and washout test is used to determine this. The relation provided below defines the coarse aggregate content. c= this is the mass of that aggregate retained by the 4.75 mm(No.4) sieve, provided that all finer materials than that sieve must be washout from the fresh concrete. The mass of aggregate must be in kg(lb) in standard surface dry condition. b=this is measured in mass per unit volume container kg(lb). This is the mass of fresh concrete sample. Same expression can be used for both Inch-Pound and SI customary. M=This is our required term for which this expression is derived i.e. mass per unit volume of air free mortar. In in-lb unit, it is measured in lb/cubic feet and in SI unit, is measured by Kg/cubic meter. b= As described in previous post, mass of fresh concrete sample measured by lb (in-lb) and kg (SI). c= This term also discussed in previous post. In brief, this is saturated surface dry mass of aggregate that retained by 4.75 (No.4) sieve. This is also measured by lb or kg in respective unit system. V=Volume of mass per unit volume container, measured by cubic feet or cubic meter. 2. Average compressive strength after 7 days for sample taken and other terms are self explanatory. 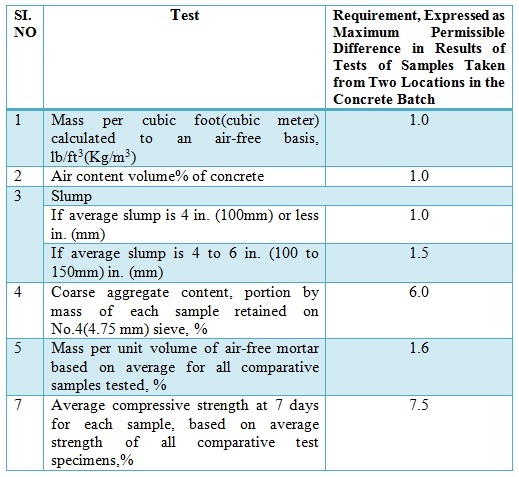 This is worth mentioning that mass per unit volume of air free mortar is determined by ‘variability test for concrete consistency’ as per designation 26, Bureau of Reclamation Concrete Manual (7th edition). In this table it is presented some variations of some parameters between two samples taken from same batch. The differences in column 3 table are derived from differences between highest and lowest values for respective test listed in column 2 of table. Now the question is-from where the sample should be taken? No doubt they should be taken from the starting and ending portions of respective batches. . Notice carefully the limits of variations provided in the table. Regarding the collection of cylinder sample, at least 3 samples are taken and result is the average of 3 cylinder samples. 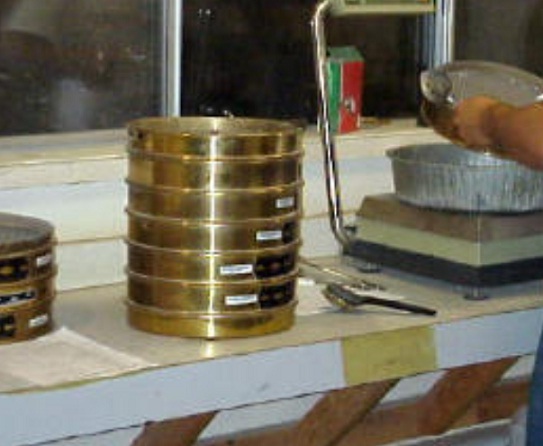 As 7 days average compressive strength is used in the table, after 7days a mix can be said uniform. The most important question is-should all these six limits be complied with the samples from a batch? The answer is five out of six tests limit in the table must comply to be said a concrete uniform.